Cat Party ideas are so fun to create! Kids love kittens and cats, and having a cat theme birthday party can be so cute! Here are some favorite ideas that our family of cat lovers has used for kid party ideas. If this is a preschool party, play games for young children at your party. They'll be perfect no matter what the theme!. Draw cat whiskers on your guests. 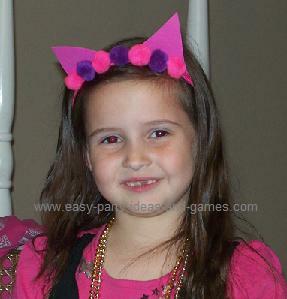 Give your guests cat ears - decorate a head band with a pair of ears attached by hot glue, like in the photo below. Make sure they spend the whole party meowing too!! For icebreaker activities, you can provide cat coloring pages, make cat paper bag puppets, or try to build mouse traps! Fun Circle Games include "Cat, Cat, Dog" (like Duck Duck Goose) or "Ring Around the Kitties" (instead of Ring Around the Rosy"
Don’t follow the Leader - We all know that a cat will never do what you say. So how about playing some anti-leader games? Sweeping Relays and Races – Take your turn at herding cats! Try to sweep objects such as balloons with a broom. Our family's favorite game! The Monster Monster Game - Actually for this game, it could be "Puppy Dog, Puppy Dog, are you hungry?" Go on a Hunt. Send your guests on a hunt around the yard to look for toy stuffed animal kitties! Plan your hunt. Cat and Mouse Game - Form a circle with everyone holding hands. Have one person be the mouse (who will be inside the circle) and one player be the cat (who is outside the circle). The cat then tries to catch the mouse. The players making the circle can let the mouse in and out of the circle to try to avoid the cat. If the mouse is caught, they become the cat and a new mouse is chosen. Ruff! You may even want to team kitty party ideas with a dog party for even more birthday party fun! More Games! If you want more games to choose from, take a look at our list of More Kids Party Games. Help Real Kitties Don't need any more presents? Ask guests to contribute to a cat rescue organization in lieu of a gift, or collect items for an animal shelter instead of presents. Cake! Don't forget to serve a cute cake! Here are some ideas for a cute cat cake for a cat party. Party Favors can be as simple as a stuffed animal cat. I've given these at parties and found my best deal on Ebay. I've even found Ty Beanie Baby Cats for as low as $1 a piece! Keep your eyes open and check frequently for good deals.